Stress is serious. It can lead to headaches, upset stomach, depression, anxiety, insomnia, and increased blood pressure. Though there are many potential sources of stress, one of the most common causes is workplace stress. In fact, over one-third of Americans experience chronic stress at work. Is your job stressing you out? Here’s how to cure workplace stress. Stress is a physical and hormonal reaction to triggers. You can eliminate workplace stress by controlling how much you exercise, what you eat, and how much you sleep. Eat whole foods. Processed foods tend to increase anxiety, and eating bad will just stress your system. You should focus on eating whole grains, fruits, vegetables, healthy fats and lean proteins. Stay away from sugary foods and refined carbohydrates. Take more breaks at work. It’s not uncommon to really push yourself hard at work without taking breaks. But breaks are crucial to productivity and reducing stress. You should schedule breaks throughout the day to walk, stretch, or do deep breathing exercises. This will help you to clear built-up stress and rejuvenate your mind. Exercise. It’s no surprise that exercise is one of the most effective ways to combat stress. Cardio exercise releases feel-good hormones in the brain that reduce stress and anxiety. Each time you feel stressed out, get up and move. You can go for a walk around the office, dance, stretch, or run in place. It’ll get your blood and endorphins flowing. Sleep more. Lack of sleep only exacerbates stress, and it can make you more irritable at work. Be sure to sleep at least 8 hours per night. If racing thoughts are preventing you from getting a good night’s sleep, try some deep breathing exercises before going to bed. A lot of people believe that stress happens to them, but in actuality, stress is a response to triggers. Stress starts in the mind as a belief. But you can reduce stress by learning how to control your thoughts and reactions. Express gratitude. While things might go wrong during the work week, it’s important to put everything into perspective. To help reduce stress and create a more positive outlook, learning how to cultivate gratitude is crucial. Instead of focusing on negative events, you should focus on positive ones. Every evening write down a few things that you are grateful for and then refer back to your list whenever you’re feeling stressed out. Meditate. Research has shown that regular meditation can help reduce stress. If you’re new to meditation, you can follow some simple guided ones using an app or YouTube. Or you can just do some deep breathing exercises. Take 15 minutes out of your day to meditate. You’ll notice that you feel calmer and happier. Learn how to say “no.” You might feel pressured to say “yes” to everyone all the time, but learning how to say “no” is valuable in reducing stress. Overcommitting yourself to others is a huge source of stress, but learning how to be selective and prioritize your time will make you feel calmer and more focused. Prioritize. With lots of deadlines looming, it’s important to be able to prioritize projects and tasks. You should understand your role within your organization as well as your personal goals and strengths. Focus on projects that will have the most impact and that are aligned with your goals. Build self-confidence. One powerful way to reduce workplace stress is to learn how you impose stress on yourself. Instead of seeking others’ approval, you should focus on building your self-confidence. Shift your focus from what others’ think of your work to work itself, and you’ll start to feel less stressed out. 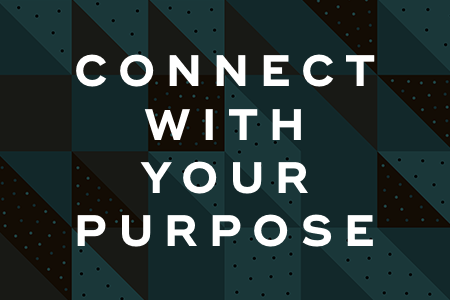 The last step to reducing workplace stress is reconnecting with your purpose in life. You are more than the work you do -- remember that you have family and friends, hobbies, and passions. By connecting with your whole self, you’ll feel less stressed and happier overall. Schedule social time. Sometimes working crazy hours prevents you from connecting with your family and friends. But it’s important to hang out with family and friends to feel recharged and rejuvenated. Make sure to schedule some time each week with a loved one to just hang out and have fun. Tap into your creativity. Setting some time aside each week to engage in something creative helps to recharge your emotional batteries. Creativity can include anything from cooking dinner to creating a vision board. Don’t forget the bigger picture. It’s crucial that you never lose sight of your vision in life, including your goals and aspirations. You can reflect on your goals and purpose by meditating on a regular basis. You’ll feel more grounded and connected. Workplace stress is a complicated thing that is caused by physical, mental, and emotional factors. 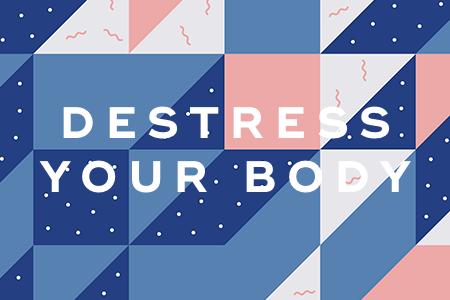 You can help alleviate stress by taking a holistic approach that includes sleeping more, eating healthy, exercising, meditating, building your self-confidence, and connecting with others. Follow the above three-step approach to workplace stress, and you’ll significantly decrease your stress. “9 Simple Ways to Deal with Stress at Work,” VeryWellMind, February 9, 2018. “12 Ways to Eliminate Stress at Work,” Forbes, March 20, 2013. 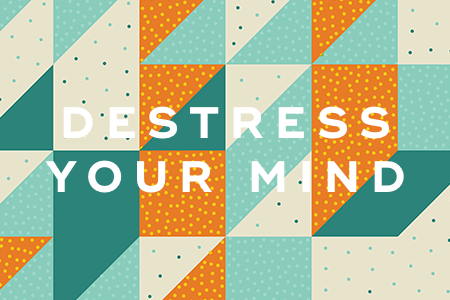 “What to Do When Your Job is Seriously Stressing You Out,” Greatist, April 20, 2015.